Home » Fun Exercises to Lose Weight Quickly » Why Should People Exercise Regularly? There are dozens of answers to the question “Why should people exercise?”, but what is YOUR OWN “why”? Why should YOU exercise? 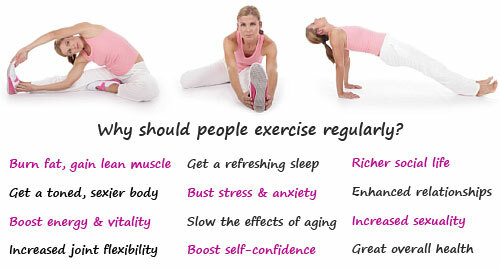 What are YOUR reasons for exercising and benefits to exercising regularly? If you are like most people out of shape or have a sedentary job, sitting at the computer long hours, you too might dread the thought of starting a regular exercise routine. But you should know that there are fun and less strenuous ways to exercise and get back in shape! How many times have you heard reasons and (more or less) scientific answers to this much-asked question, Why should people exercise? I bet a LOT, right? No wonder, since the benefits to exercise are far beyond increasing your metabolism and burning fat to lose weight. As you start incorporating exercising in your life, you begin to feel younger, more alive, self-confident, flexible, with less aches and pains. Exercising tones your muscles and increases oxygen in your system to benefit all parts of your body. And there’s so much more! Before going any further, consider this. To lose weight and experience the countless benefits to exercise, you don’t have to take up high intensity training (the best exercise to burn fat). This may be too strenuous if you’re out of shape. In fact, you don’t have to take up any other type of exercise in particular. However, in order to exercise regularly you should look forward to your workout, so you have to have fun! Find a type of exercise that you like – choose from this list of fun exercises to lose weight fast. 12 Answers to the Question, Why Should People Exercise Regularly? 1. Burn calories (stored as fat) increasing your fat-burning lean muscle mass, hence your fat-burning rate, even at rest. 2. Look better – as you tone your body, no matter how much you weight, your clothes fit better, you get a healthy glow and a happy spark in your eyes. 3. Increase your energy levels and vitality, as exercising brings more oxygen in your bloodstream. 4. Improve your flexibility and joint mobility (perhaps this is the most valuable answer to the question why should people exercise if you are not looking to exercise for weight loss) – whether you suffer from heart problems or arthritis, reduced mobility is affecting your quality of life. 5. Improve your sleep, get rested and refreshed – as a well-oxygenated, increased blood flow all day makes for a great night’s sleep. 6. Increase the relaxation response, i.e. release mental and emotional stress, anxiety, frustration, anger, depression – this is a natural result of the increased levels of endorphin and serotonin in your brain; moreover, experience the much-talked about “workout high” due to an increased endorphin and norepinephrine production – the “feel-good” hormones causing you an euphoric feeling that makes you feel great, fulfilled and unstoppable! 7. Improve your cardiovascular health and decrease your risk of heart disease as you reduce blood cholesterol levels – as you know, being overweight and having a heart condition go hand-in-hand. 8. Slow the effects of aging and prevent major disorders like diabetes, various cancers, osteoporosis, Parkinson, dementia, as all of your body’s systems work more effectively and the increased blood flow from exercising is especially helpful to your heart, major organs and brain. 9. Increase your self-confidence – the better and healthy you feel and the better you look, the better your self-confidence. 10. Increased sexuality – as you have more energy, your body awareness increases and blood circulation improves to your sexual organs when you exercise. 11. Improve your social life – as you get out and meet new people at aerobics classes, yoga, jogging, or just power walking in the park. 12. Enhance your close relationships and become a role model for your kids; when your child asks, “why should people exercise”, you will be able to answer from your own experience helping her or him understand the importance of a healthy lifestyle. …the physical and psychological benefits to exercise are too many to be ignored! The above answers to your question, “why should I exercise?” should get you started on a regular workout practice. As you start enjoying these powerful benefits you’ll certainly get the motivation to stay on track! Sooner than you think, as you get in shape, you’ll enjoy the many different exercises to lose weight.